You know you are addicted to Candy Crush when you start trying to arrange your desktop icons to 3 in a row unconsciously when you are talking on the phone. Thank goodness life does not revolve around me and crushing candies. Life is much more bigger and important than that. I came across a wonderful creation the other day that I believe it's worth sharing because it is artistic, environmental friendly and pretty. Useful in so many levels (unlike scumbag Candy Crush levels ._.). Any idea what this is? 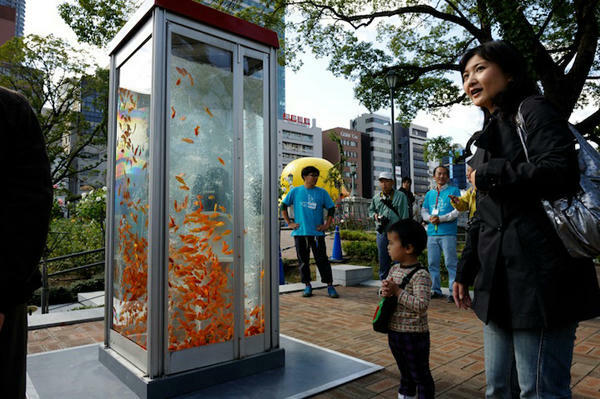 It's an old phone booth transformed into a beautiful aquarium in Osaka, Japan! Hence the title "From nothing to something, Life is Created". Ever since the introduction of smartphones and tablets, phone booths / payphones are something of the past and has ever since been neglected. 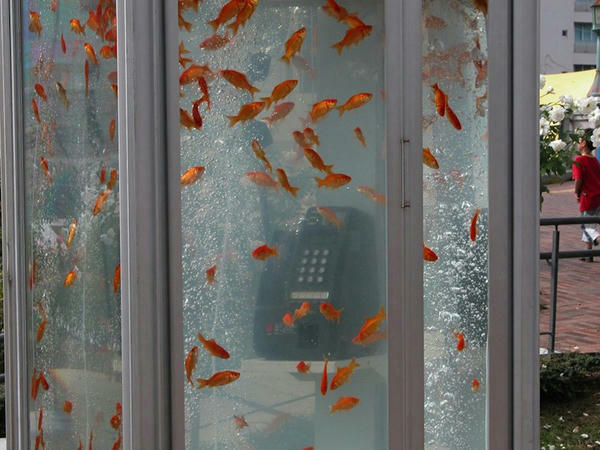 It became a waste of space and taxpayers money to maintain or fix such payphones so an artist collaborative called Kingyobu (Literal translation: "Gold Fish Club") came up with the idea of creating something beautiful to the eye, life sustaining and it's free! 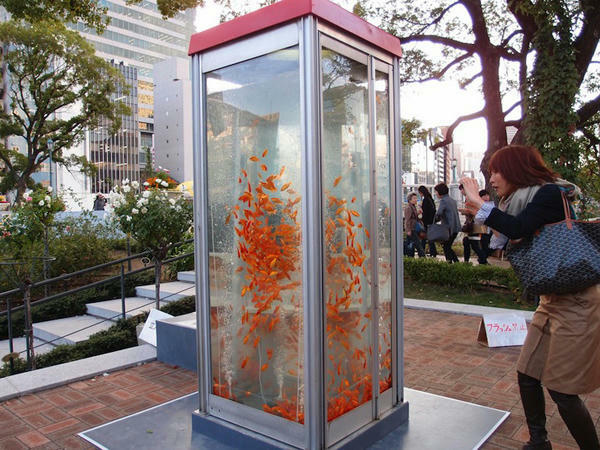 They started converting payphones into giant goldfish aquarium - a really fantastic idea and not to mention fun! It also serves as a very unique attraction and appealing to anyone irregardless of their age or profession, locals or tourists! It really is just a simple idea but sometimes simplicity is the best and this is one very good example of it. 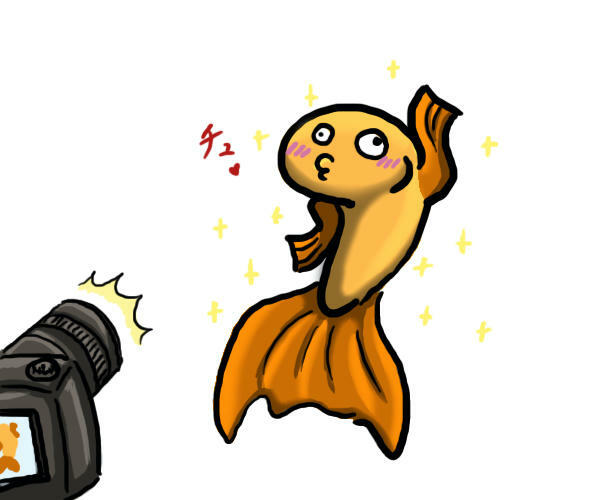 Obvious Caption: Japanese lady taking pictures of the pweety swimming fishes! 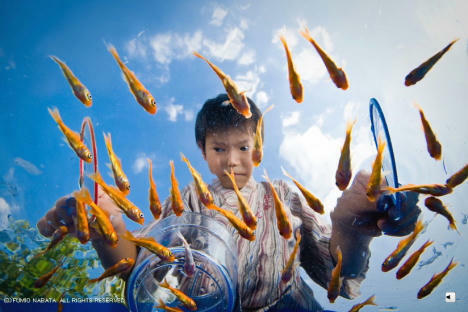 Goldfish is deemed important in the Japanese culture that there are lots of Kingyobu/Gold Fish Clubs around that specialized in breeding Goldfish ever since Goldfish was introduced to Japan in the 1500 which were only allowed to be bred by Samurai or the Aristocrat families. 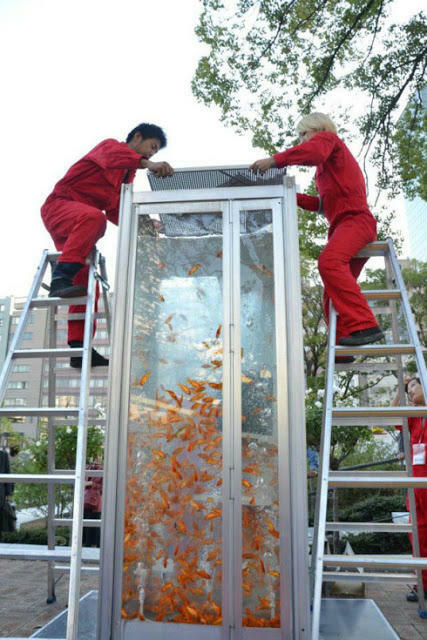 There are even various grand Goldfish competition going on around all year long in Japan where notably the most famous one is the All Japan Ranchu Show that is held every November 3rd for the past 50 years and the grand winner will be bestowed upon a certificate signed by the Prime Minister of Japan (goldfish and PM signed Certificate O.O). 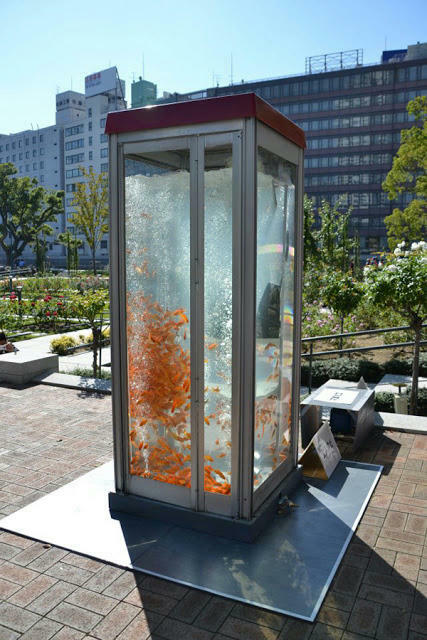 There's also the old 'Goldfish scooping game' or properly known as the "Battle of the Natsu-yasumi) that has been made popular and can be found in nearly every summer festival in Japan where visitors pays a small amount of money to get a chance on trying to fish a baby goldfish using a thin layer of tissue paper (which can be seen in a lot of anime). 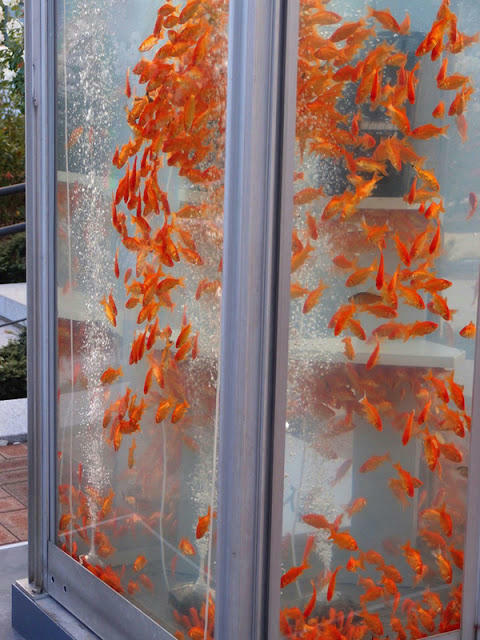 Wonder if they are going to create more of those aquariums. Would definitely be awesome! wowww! very creative and unique! great idea! btw, i blog more on Vault of Camy instead of Stop & snap. Awesome! They should totes do that in England. Hi thank you for following me in my blog! Wish we could see this in Malaysia too eh? :) Too bad our phone booths don't have a 'booth' to begin with. And god, if I had known you were going to put it as an ending post, I'd have drawn it better xD It's so crappy! lovely blog and Nice pics!! Its amazing what art can be created if people just use their imagination. Oh my gosh, I just love this!! It makes you happy just looking at the pics!